Welcome to a new semester with English 362: Grammar of the Standard Written English! As your mentors, Alyssa and Cheyenne (that’s us!) are here to help you with any questions you have. We want you to be the best you can be! You can find us in the lounge on the 3rd floor of Laurentide Hall. If you can’t meet with us in person, you can also send a question by commenting on our blog, tweeting at us @PWP_Mentors, or sending us a message on Facebook at UWW PWP Mentors! Almost done Pwips! Congratulations! As you review for the final, make sure you study Professor Baumgardt’s handouts. They nicely summarize all the main topics that we covered. Also, review sample sentences and diagrams. You should be able to diagram sentences down to the very last word. Professor Baumgardt has a study guide that covers everything you need to study. 2. Create NP node and PredPhr node, and nodes for any postcore or precore elements. 5. 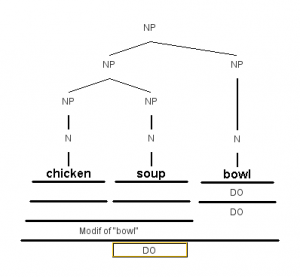 Divide any NPs into nodes of its head N, and any other elements such as adjective phrases, PrepPhrs, DetPhrs, etc. 7. Divide any Detphr into any pre-determiners (PreDet), the main Det, and post-determiners (Post-Det). Also, mark the “of” as a Prep in form and Link in function. 10. Remember that the function of the head of the phrase is the function of the whole phrase and vice versa. See page 45 for a list of diagram Form and Function labels. Also note pp. 48-9 for the definitions of the different phrases we learned about. Good luck all! Study hard! Prepositional phrases are still a part of the passive construction. Adverbials and adverbial complements, however, do differ in how they are a part of a passive sentence. As a reminder, adverbial complements are a part of the PredPhr. This means that the NP of the adverbial complement (or the PrepComp), can become the subject of a passive sentence. Ex. : I listened to the lecture. ————> The lecture was listened to by me. However, if the verb of the sentence has a DO, then the PrepComp cannot become the subject. The DO must be. Incorrect: Olivia taught the pwips about diagrams. ———-> ***Diagrams were taught the pwips to by Olivia. Correct: Olivia taught the pwips about diagrams. ————> The pwips were taught about diagrams by Olivia. Adverbials are not a part of the sentence core. This means, unlike adverbial complements, they can never be the subject of a passive sentence. Incorrect: I tried on Thursday. ———-> ***Thursday was tried on by me. Correct: I tried on Thursday. ———–> (It) was tried by me on Thursday. 1. The modal auxiliaries that express “modalities”, or ways of modifying the meaning of the verb by suggesting an obligation or degree of probability. Now we will add another element to the VP formula—the passive. The passive is formed by the auxiliary verb to be followed by a verb in the –en form. Along with being an auxiliary, the passive creates an interesting word order in sentences. My first princess Barbie doll was destroyed by my older brother. Notice how the subject (my first princess Barbie doll) is not the thing performing the action. Rather it is receiving the action. Instead the noun phrase “my older brother” in the PrepPhr is the performer of the action. This is the unusual word order that the passive creates in a sentence. The prepositional phrase “by my older brother” is called the by-phrase. When a sentence is in the passive, you can change it to an active sentence by taking the NP in the by-phrase and making it the subject. My older brother destroyed my first princess Barbie doll. We call the NP of the by-phrase the agent. When you diagram a by-phrase, its form will be PrepPhr, and its function will be Agentive. The NP of the by-phrase will simply be PrepComp. Heyo pwips! Since there seemed to be some confusion about this in class, here’s some more instruction on nouns that modify nouns. 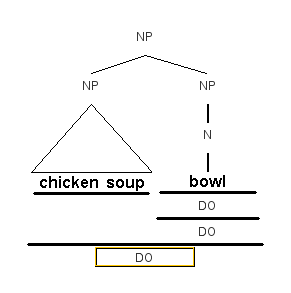 To break it down further, we know that “chicken soup” is a noun phrase on its own. This means that there must be at least two NPs branching off the original NP node, like in the figure below. However, we still have an NP made up of 2 nouns, which we can break down further. Because there are two distinct nouns in the phrase, each noun must get another NP node, as shown in the figure below. Now that all of the forms are sorted, we just need to figure out the functions. One of the two nouns in “chicken soup” must be the head noun. 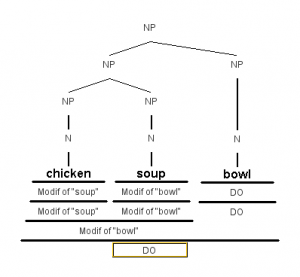 Because the function of that NP is “Modif of ‘bowl,'” we know that the head noun’s function must also be to modify bowl. The word “chicken” does not seem to modify bowl. “Chicken bowl” is not a common phrase. “Chicken,” however, can modify “soup.” “Chicken soup” is a phrase, as chicken describes the type of soup. If chicken is not the head noun, that means it must be “soup.” This fits, as “soup bowl” is a common enough phrase. “Soup” describes what the bowl is used for. 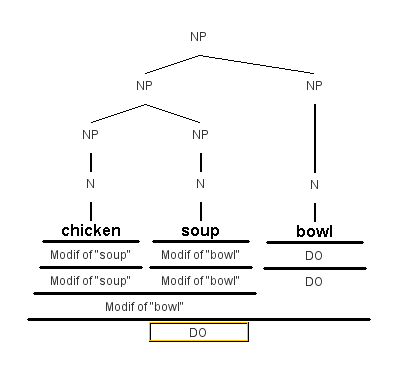 Its function must be “Modif of ‘bowl,'” as shown in the figure below. Congrats! We successfully diagrammed nouns modifying nouns. You can do this with other constructions. Just remember to break the nouns down by phrases with each phrase getting a new NP node until you are left with one word phrases. These nouns are usually names. They can refer to a specific person, place, institution, etc. There is a mass/count distinction that separates nouns that can be individually counted from nouns that come in masses of material. Concrete nouns are nouns that are tangible or perceptible. Abstract nouns usually refer to qualities, ideas, and activities. Heyo Pwips! Let’s talk about plurals! Most nouns are made plural by simply adding -s to the end. However, there are some special English nouns and nouns that come from Latin or Greek that we use. These nouns do not follow the pattern of simply adding -s. Lets take a look at the singular and the plural forms of these nouns. Words that end in –is form the plural with –es. Heyo pwips, let’s talk determiners! Heyo Pwips! We are on to chapter 8! In this chapter we will focus on the noun phrase. An important element of the noun phrase is the pronoun. Pronouns are substitutes for noun phrases (they take the place of a noun). There are several types of pronouns, but the set called personal pronouns are the core of this pronoun system. Person refers to first-person form, second-person form, and third-person form. Case: a distinction that refers to how a word functions in the sentence. There are 3 types of case: Nominative (means the word functions as a subject in the sentence), Objective (means the word functions as an object of some kind) and Possessive (means the word indicates possession). Our family turns into a flock of swindling, mafia vultures when it comes to left over dessert! That is my pumpkin pie! Mom put your pie in the fridge. In my family, you have to mark your food, hide it, and play guard patrol during mealtimes. Yours is in the fridge. Olivia on English 362: Glorious Diagrams! Carly on English 362: Glorious Diagrams!